The growth in home prices slowed in June, while still tripling the pace of overall inflation. The S&P CoreLogic Case-Shiller home price index rose 6.3% year-to-year for the 20-city composite index, down from 6.5% in May. A housing economist for Standard & Poor’s said housing price growth is easing amid flattening sales of both new and existing homes. Even though inventory is improving in some parts of the U.S., the economist said, rising prices and mortgage rates are affecting affordability. The Conference Board said its consumer confidence index rose in August to its highest level since October 2000. Consumers raised both their assessment of current conditions and their expectations for near-term prospects for employment and income. The business research organization said confidence rebounded from setbacks in June and July, suggesting solid economic growth supported by healthy consumer spending at least through the end of the year. The U.S. economy grew at a 4.2% annual pace in the second quarter, the most robust three-month expansion since the third quarter of 2014. The second of three estimates was up from an initial report of 4.1% growth. The Bureau of Economic Analysis said the faster pace in gross domestic product came from upward adjustments in commercial investments and government spending. Consumer spending rose at a healthy 3.8% annual rate, down from 4% in the initial estimate. The Federal Reserve’s favorite measure of inflation rose at a 1.9% rate, just below the Fed’s target rate of 2%. Pending contracts for existing home sales dropped 0.7% in July and were down 2.3% from July 2017, the seventh consecutive year-to-year decline. The National Association of Realtors blamed “multiple years of inadequate supply” for driving prices higher than would-be homebuyers could afford in many markets. Even so, the trade association said, foreclosures have been near record lows and price increases have fueled the wealth effect, which inspires consumer spending. The association forecasts selling 5.46 million houses in 2018, which would be 1% fewer than in 2017. 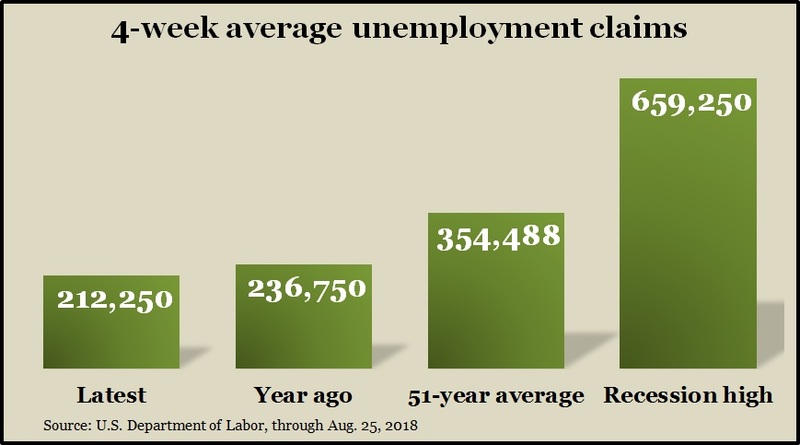 The four-week moving average for initial unemployment claims fell to its lowest level since December 1969. New jobless applications remained 40% lower than the 51-year average, according to Labor Department data, indicating an extended reluctance by employers to let go of their workers. Economists say the tight labor market has been fueling the confidence that drives consumer spending, which accounts for about 70% of U.S. economic growth. Consumer spending rose 0.4% in July, the fifth consecutive gain, according to the Bureau of Economic Analysis. Spending rose faster than the 0.3% increase in personal income, so the personal saving rate declined to 6.7% of disposable income. The latest monthly measure of the Fed’s preferred inflation gauge was 2%, up from the 1.9% year-to-year gain posted in June. The University of Michigan consumer sentiment index rose from its mid-month level but ended August at the lowest point since January. In particular, sentiment toward current economic conditions have declined from historically elevated levels as consumers have expressed greater concern over rising prices and interest rates. An economist with the longstanding consumer survey said the index suggests consumer spending will grow about 2.6% in the next year.